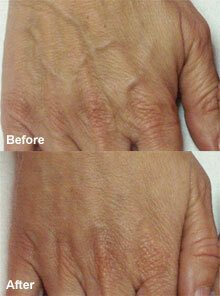 For helping to rejuvenate the aging of hands, which may include a loss of volume, pigmentation, age spots or hand veins. Frequently the focus of cosmetic improvement is the face. Yet, one of the most age-telling body features is our hands. As we age, our hands lose firmness and plumpness and begin to look bony and fragile – with vein and joint protrusion, thin crepe skin texture and often they’ve become flecked with brown spots from sun exposure. Dealing with aging hands takes more than hand cream (though this can make a difference). The latest technology has given us a set of procedures that will have similar effects as those we accomplished with the face. By using injections we can immediately re-plump and replenish volume to the back of the hands to provide a supple and youthful appearance instantly. 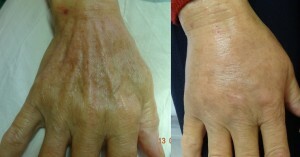 Placed beneath the skin, this procedure raises the skin level so that tendons, joints and veins lose their prominence. It provides instant and durable long-lasting results. Because this approach provides a scaffolding for collagen-building, the body’s own collagen interweaving into this structure keeps the skin feeling softly natural and smooth. If you prefer a natural approach, we can deliver results over time by inducing your own collagen regeneration. The actual amount of material placed in your skin is very minute. The final effects come about in 3 to 4 months and at that point is almost exclusively your own natural collagen. If your hands are affected by age spots or liver spots, we use laser to break up this pigment so the body can eliminate it. The laser seeks out darker pigment and fragments the pigment particles. As they are reduced to ultra-microscopic size, these dark pigment cells quickly surface and are both eliminated by the body’s clean up cells as well as by the natural turnover of epidermal tissue. Brown Spot Removal – if you have spots or brown patches, you will first have treatments with the laser to remove these aging collections of pigment. Volume Replenishment – You may opt for instant results or choose the collagen stimulator, which over time promotes your own collagen as the “filler”. Volume Replenishment – Typical requirements are a total of 1 treatment per hand to attain a full smooth replacement of the cushioning on the back of the hands. In some instances an extra treatment is required (total 3) if your hands have lost substantial mounts of their natural fat layer or have a very prominent bony appearance. 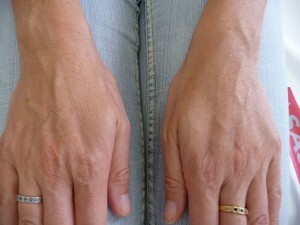 Men may require up to 2 treatments if their hands are large. Topical serums with hyaluronic acid and tissue growth factors, augment the skin’s cell hydration and surface smoothness. Endovenous laser treatment uses laser energy delivered in a thin fibre-optic probe to vessel wall. It causes vein fibrosis. Vein then disappears. The vein is punctures through an anesthetized site. A laser fibre is passed through a needle down into hand veins. Local anaesthetic is infiltrated around the vein. The laser fibre is then slowly withdrawn destroying the full length of the vein. The procedure causes minimal discomfort. Compression is applied after treatment. There may be minor soreness and bruising. You may return to normal activities immediately.